April 2018. Prolonged drug residence times may result in longer lasting drug efficacy, improved pharmacodynamic properties and "kinetic selectivity" over off‐targets with fast drug dissociation rates. However, few strategies have been elaborated to rationally modulate drug residence time and thereby to integrate this key property into the drug development process. A team of scientists from Frankfurt, Oxford, Berlin and Heidelberg now report that the interaction between a halogen moiety on an inhibitor and an aromatic residue in the target protein can significantly increase inhibitor residence time. 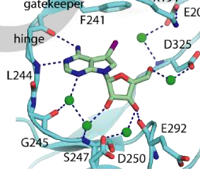 By using the interaction of the serine/threonine kinase haspin with 5‐iodotubercidin (5‐iTU) derivatives as a model for an archetypal active state (type I) kinase‐inhibitor binding mode, they demonstrated that inhibitor residence times markedly increase with the size and polarizability of the halogen atom. This key interaction is dependent on the interactions with an aromatic residue in the gatekeeper position and they observed this interaction in other kinases with an aromatic gatekeeper residue. The team provides a detailed mechanistic characterization of the halogen‐aromatic pi interactions in the haspin‐inhibitor complexes by means of kinetic, thermodynamic, and structural measurements along with binding energy calculations. Since halogens are frequently used in medical drugs and aromatic residues are often present in the binding sites of proteins, their results provide a compelling rationale for introducing aromatic‐halogen interactions to prolong drug‐target residence times.